I am proud to admit that I am a Gleek - a fan of the musical TV show Glee. 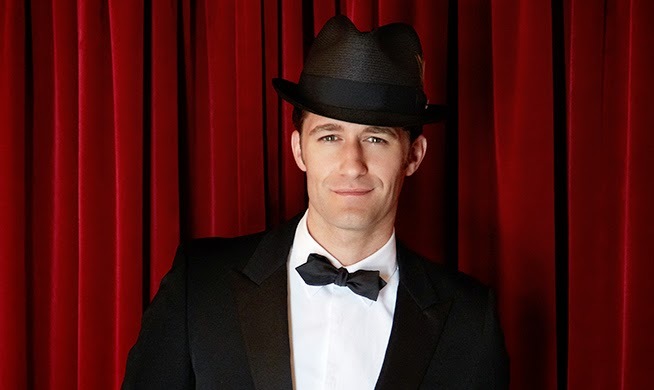 But I was a fan of Matthew Morrison long before he began appearing on the show as the beloved teacher Will Schuester, in fact he's the main reason that I started watching the show and that I continue to watch it. I saw him play Lieutenant Cable in an absolutely luscious production of South Pacific at Lincoln Center in 2008, and even before that I fell in love with his voice as the original Linc in Hairspray and the original Fabrizio in Light in the Piazza (a role that earned him a Tony nomination). So it was an absolute thrill to see him perform live again, this time with our very own Minnesota Orchestra, that has recently reunited after a much-too-long absence due to contract issues. 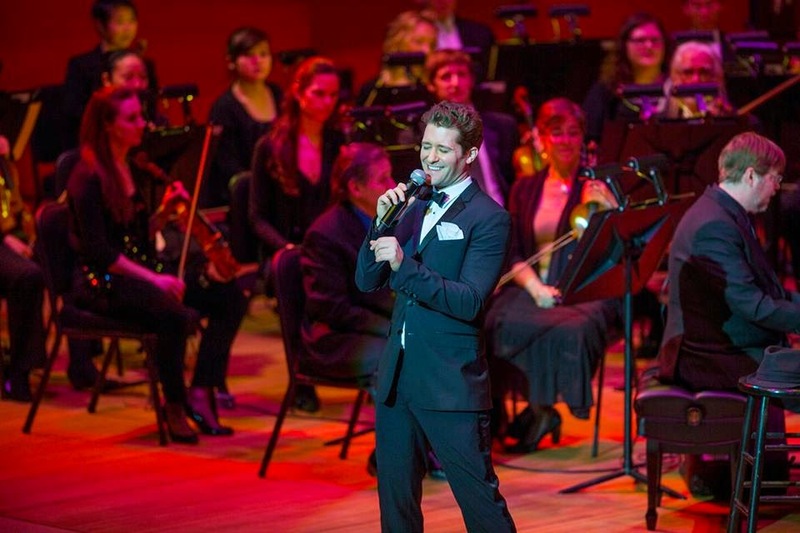 Whatever those issues were, I'm glad they worked it out because there's not much better in the world of music that a full orchestra, especially when joined by such a talented singer and performer as Matthew Morrison! The concert began with a few musical theater selections performed by the orchestra, conducted by Sarah Hicks and her fantastically toned arms. Their song selection was a great preview for things to come this summer - the Overture from Leonard Berstein's Candide can be heard again this summer when Skylark Opera performs this epic and historic music-theater piece, and the medley of songs from Lerner and Loewe's My Fair Lady got me all excited to hear all these great songs in the Guthrie's production this summer. They closed with a medley from The Sound of Music, because who doesn't love The Sound of Music (you know I do!)? Matthew's set list was comprised almost entirely of songs from his most recent album, Where It All Began. He sang all but one of the songs on the 12-track album, which features songs from musical theater and standards. It's a terrific album that I listen to often, and it was great to hear those songs in person, plus a few other standards. No Glee pop songs here, Gleeks! (Personally I was hoping for my recent favorite Mr. Schue song, "Danny's Song," but that desire was satiated by the practically perfect finale of TV's most underrated sitcom Raising Hope). Matthew's voice is gorgeous and effortless, with a style perfectly suited to this genre of music. But that's not all - he also dances! He occasionally set the mic down to do a full dance number, but even while singing, his every movement, big or small, matches the music. He's a true performer and entertainer. Here are just a few of the many highlights of the concert. Matt joked that this was the dress rehearsal, as he took the red eye Friday night after a full week of filming and only arrived in Minneapolis that morning. Musical theater highlights include "Younger than Springtime" from the aforementioned South Pacific, the gorgeously sad Sondheim song "Send in the Clowns," and a medley of songs from one of my favorite musicals West Side Story. 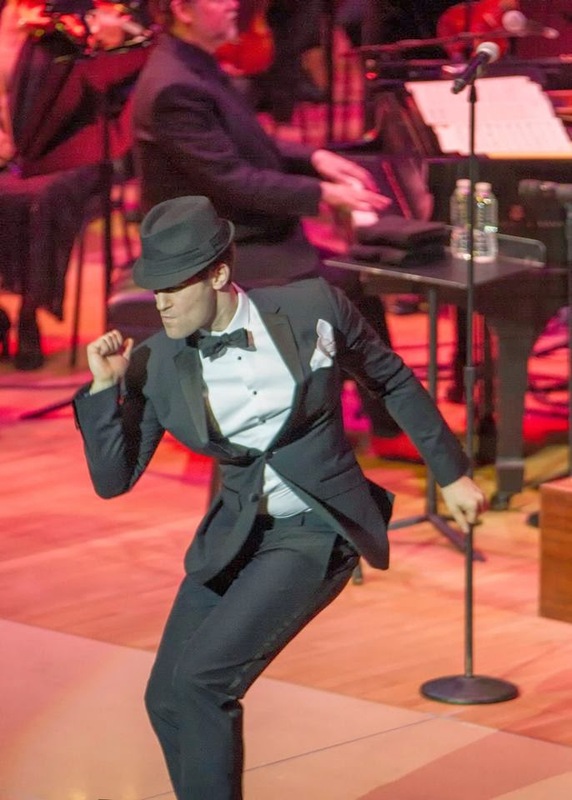 The dance moves in "It Don't Mean a Thing" and "Singin' in the Rain" were fantastic, he's so smooth! He looked pretty smooth too, in a tux with a black fedora that was as much a prop as an accessory. Matt started to dedicate "The Lady is a Tramp" to all the ladies in the audience, but then took it back thinking it would be offensive. Not at all, this is my theme song ("she gets much too hungry to eat dinner at eight, she adores the theater, but won't arrive late"), especially when he changed the line to "she thinks the Twins are divine!" The one "Mr. Schue song" he sang was the Dean Martin classic "Sway," in which he jumped off the stage and danced with one lucky audience member. I was tickled to see Glee's resident piano player Brad Ellis as the music director/arranger/piano player. I love him on Glee because he's always just suddenly there when they need him, and never speaks, but conveys much with his facial expression. Turns out he's a talented musician too! Matt promised us that there will be no more snow, which I'm choosing to believe. This was my first time in the newly renovated Orchestra Hall, and it's gorgeous. The lobby is light, open and airy. My only complaint about this concert is that it was too short; I could have sat there for hours listening to Matt sing and watching him dance. But he's a busy man with a TV show to film. I'm excited to see what he'll do after Glee's final season next year. In my opinion they have woefully underutilized his immense talent, as Mr. Schue is too often seen merely cheering on the kids and not allowed to sing and dance nearly enough. As he said, Glee has been a wonderful way to share musical theater songs and musical theater actors with a larger audience, but I hope to see him back on a Broadway stage soon! It's quite obviously what he was born to do and what he loves to do. ... and he dances like a dream! My wife and I loved the concert. The orchestra was stunning and Mr. Morrison is all of the dancer that Gene Kelly ever was and 10 times the singer! You could tell his voice was being put to work, as his head voice was just a tiny bit shaky, but my gosh, he's singing LIVE with one of the best bands in the world!! What fun!!!!! If you're a MN Gleek, you should know that Chris Colfer will be in Saint Paul on July 16. Sadly, he's not performing. He'll be at Red Balloon signing copies of his new book, The Land of Stories: A Grimm Warning.